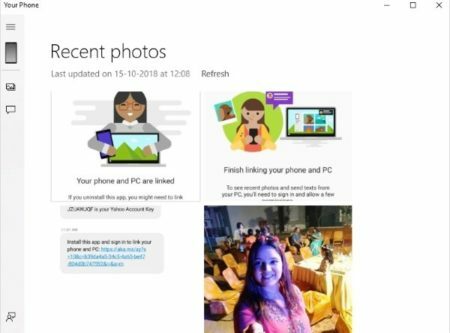 Your Phone is a free Windows 10 app to connect your phone and PC to get instant access to data. How many times have you wanted to include pictures from your phone’s photo gallery and had to email the photos to yourself. How many times have you wanted to access your phone messages while in a meeting where you can’t carry your phones. Situations like this happen to all of us and they are quite frustrating. Specially emailing yourself photos from your phone every now and then, wishing there was simpler way to take photos from your phone to PC. Well this app come in handy at times like this. Your Phone creates a link between your phone and PC, using which you can access all your phone photos and messages on your PC. Once you connect your phone to PC you can simply copy-paste photos from your phone to your PC easily. Similarly, you can read messages right on your PC and even reply to them from your PC. Let’s get started with this app. Once you have installed this app on your computer, go ahead and launch it. As soon as you launch it you will see an interface like the one shown in the below screenshot. Go ahead and click on get started button. 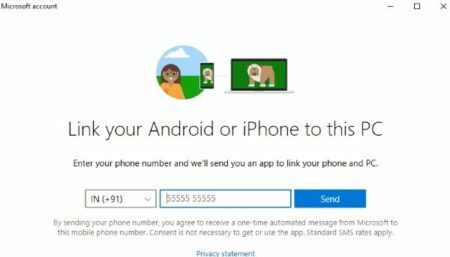 This will bring you to a screen where you will be asked to connect your Microsoft account with the app. Sign in using your Microsoft account do is username and password. After you sign in you will see a screen like the screenshot below asking you to connect your phone and PC. Click the link phone button. You will be asked for your phone number and country code. Country code would already be filled in, now all you need to do is enter your phone number. This can be seen in the screenshot below. The app is going to send you a link of the app that you will be using to connect your PC and phone. You will get a text on your phone to download and install an app so that you can connect your phone and PC. Go ahead and click on the link sent to you in the text. This link will take you to the Google Play Store to download the Your Phone Companion app. Once you download and install the app, go ahead and open it. Now sign in to the app using your Microsoft account. The below screenshot is from the phone screen. Once you sign in you will see a screen like this on your phone. You will also be asked for additional permissions by this app, which will pop up on your screen. After you give permission to this app, you will get this screen letting you know that your PC and phone are connected now. Now go back to your PC and look at the app screen. You will see that your phone is now connected with the app and you will start seeing the photos and messages from your phone on the app interface. This can be seen in the below screenshot. You will now be able to access all your phone photos through this app. You can also access your phones messages through this app. 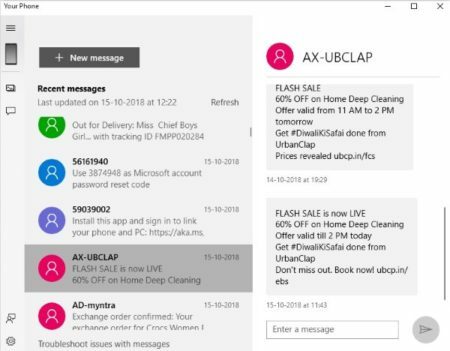 The messages page screenshot can be seen in the screenshot below. Now you don’t have to look at your phone every time you get a new message. You can access the phone messages right from your PC. Similarly, every time you need a photo from your phone, you don’t have to email it to yourself. You can simply go to this app and use any photo you want from your phone. Link your phone and PC easily. Get access to your phone photo gallery and messages on your PC. Drag-drop photos from phone to PC. Copy or share photos by right clicking on them. Messages can be read and replied to from the app screen. Your Phone is a nice app to connect your phone and PC to access all your phone photos and messages on PC. With the help of this app you don’t have to look at your phone again and again. You can access the phone messages from your PC. Go ahead and try this app out. 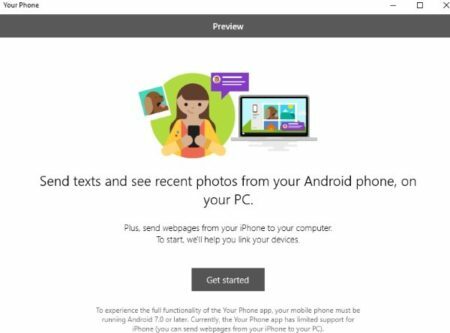 Check out Your Phone for Windows 10 here.